Attracted by the movie wall poster, the boy stood still, gazing at it unmindful of the surroundings. His history teacher, who was also his tutor at home, was passing by. He observed the boy for a while, went to him, patted on his back and said, “Do you want your name to appear on such a wall poster? Don’t worry, one day it will.” Years later, the teacher’s prophecy came true. And the boy, Tatineni Surya Prakasa Rao, then a student of the Kapileswarapuram Middle School, went on to become a famous filmmaker, not just in Telugu, but also in Tamil and Hindi. He used to trek the distance of two miles from his school to Kaja Venkatramaiah’s touring talkies at Veerankilaaku to see a movie. For this he befriended the theatre operator by getting him beedi and soda. This almost was his daily routine after school hours. Tatineni Prakasa Rao imbibed the patriotic qualities of his father, Veera Raghavaiah, a staunch Congressman. But he was attracted towards the Leftist movement and, during his college days, was an active member of the Praja Natya Mandali. Having lost his father at a very young age, he was under the care of his maternal uncle, Chiguluri Seshaiah. To divert his attention from politics, Seshaiah got him a job as a cinema operator apprentice at the very same theatre where Prakasa Rao watched movies in his school days. He later worked as an operator at a theatre in Kolluru near Tenali. Still a Leftist follower, he led a hunger rally from Kolluru to Tenali in 1939 and was arrested. The result, he lost his job. This gave him an opportunity to spend all his time in plays of Praja Natya Mandali. During one of the troupe’s sojourns in Madras in May 1946, Prakasa Rao met the veteran director L.V. Prasad. Exactly a year later he was working as an assistant director under L.V. Prasad for the movie Drohi . He later worked with him for Manadesam , Samsaram , Shavukaru and Pelli Chesi Choodu . During his stint with Vijaya Productions, he had the opportunity to work with K.V. Reddi for Pathala Bhairavi . It was during the post-production work for Pelli Chesi Choodu , that Prakasa Rao got the opportunity to wield the megaphone for Palletooru . This was the first venture of People’s Art Pictures, the production company started by his friends from Praja Natya Mandali. Prominent progressive writers of the time, Sunkara Satyanarayana and Vasireddi Bhaskara Rao, popular as Sunkara-Vasireddi duo, wrote the story, dialogue and most of the lyrics. Some songs were taken from the popular works of Sri Sri and V. Srikrishna. Most of the actors were Praja Natya Mandali artistes. Nandamuri Taraka Rama Rao (NTR), Kommareddy Savitri and Samarla Venkata Rangarao (SVR) were signed to play the lead roles. Chandram (NTR), a progressive youth, guides aimless villagers towards the righteous path. Angered by this, the vicious village moneylender Ganapathi (SVR) conspires with his cousin Sankaram (Ramana Reddy) against Chandram. The family of Chandram -- mother Seethamma (Commuri Padmavathi Devi) and sister Lalitha (P.L. Krishnaveni) --- has a good relationship with the village elder Sambaiah (Koduru Achaiah), whose daughter Suguna (Savitri) likes Chandram. Ganapathi spreads a rumour that Santha (T.G. Kamala Devi), wife of his servant Kondaiah (Nagabhushanam), has developed illicit relationship with Chandram. Kondaiah blindly believes this and throws Santha out. Not knowing his villainous side, Sambaiah decides to perform Suguna’s marriage with Ganapathi, but she opposes it. How Chandram manages to end Ganapathi’s atrocities and marries Suguna forms the rest of the story. Though there is no novelty in the story, Prakasa Rao’s deft handling of the narrative helped sustain viewers’ interest. He himself admitted in an interview that both L.V. Prasad and Chakrapani had great influence on him. While handling a story his first thought used to be how Chakrapani would write that scene and, on the sets, how Prasad would handle it. That was how he worked at the beginning of his career and, before going to the shoot, he’d discuss the script with Chakrapani. For Palletooru too he followed this. The roles were a cakewalk for NTR and SVR. Savitri too came up with a neat portrayal along with Nagabhushanam and T.G. Kamala Devi and veteran stage artiste Koduru Achaiah. Ramana Reddy, who debuted with Mayapilla (1951), displayed with such ease the comic-villainy that he soon found a permanent place in Telugu cinema. 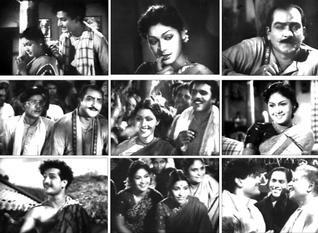 Later day popular director V. Madhusudana Rao, producers A. Pundarikakshaiah and Thammareddi Krishnamurthy did cameo roles. Ghantasala Venkateswara Rao’s musical score helped sustain audience interest. In fact only when S. Rajeswara Rao opted out of the project, Ghantasala stepped in. Sri Sri’s ‘Polala nannee…halaala dunni…,’ V. Srikrishna’s ‘Cheyyetthi Jai kottu Telugoda…’ and Sunkara-Vasireddi’s ‘Aa manasulona…’ became very popular. Tatineni Prakasa Rao believed that a film should make people think. He followed this even in his debut film but combined his progressive thoughts with family drama, and ultimately left the audience confused. The result was the movie had an average run. But his directorial talent earned recognition and he went on to become a much-sought-after director not only in Telugu but in Tamil and Hindi films too.